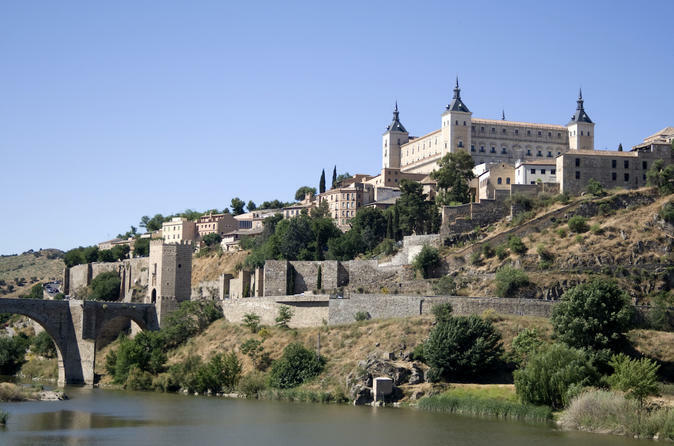 Set out on a wonderful private tour of the stunning city of Toledo, a notable UNESCO World Heritage site. You will be impressed by the Roman, Moorish, Jewish and Christian influences, and also by the location of the city: on the top of a hill, almost surrounded by the river Tajo. You will be collected at your centrally located hotel in Madrid and driven 70 Km to the Southwest to visit the 'City of Tolerance’, as it is known, due to the fact that Jews, Muslims and Christians lived together relatively peacefully during many centuries. This is one of the most pleasant and popular day trips from Madrid, and it is a superb site to experience historic architecture and enjoy world-class art: The Alcazar, the Cathedral, the famous El Greco painting of 'The Burial of the Count of Orgaz’, and the Jewish quarter and its synagogues, are some of the highlights you will be able to see. And if you love buying presents for your loved ones, you will find damasquino metalwork and artisanal pottery as the artistic specialties of the city. The tour will be led by a professional tour guide, and will last around 5 hours. This tour is for you and your party only and you can therefore undertake it in the morning or in the afternoon (the start time is set for 9:00 am, but once you have booked your tour and received the confirmation voucher, you will have the full operator information; at that point, please contact the local operator to change the start time if you prefer a different one. Please note that you should do this as soon as possible after receiving the voucher, otherwise the local operator may have no availability for a different timing). And, of course, you will travel in a luxury Mercedes Benz (car, minivan, or 8-passenger van, depending on the number of people of your party).